Yesterday, the CEO of Redmi published a double image on the Weibo social network, letting his fans choose what the next flagship of Redmi will be . Every day it is clearer that Redmi 's new high-end mobile device is closer than ever. And, in addition to this new publication by Lu Weibing , the same CEO said a few days ago the fact that it will be soon when we see this new terminal . 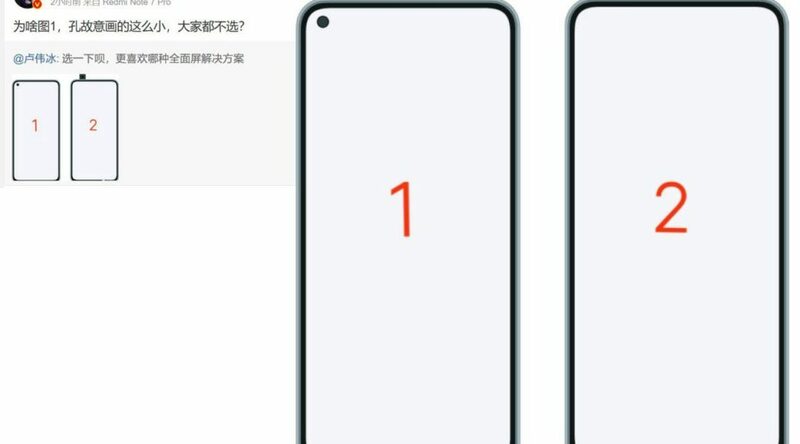 Now, the manager himself has left a double image on Weibo (Image published below) where he lets us see two different fronts of a new device. Specifically, one of them shows us a mobile terminal with hardly any frames , where the front camera has been integrated into the screen itself , just at the top left. A design similar to that already seen in other Samsung phones. Image published on Weibo by Lu Weibing, CEO of Redmi. In second place we have a terminal that also has frames almost nonexistent , but this time, its front camera is arranged in a new retractable system . It should be noted that this system has been widely rumored prior to this publication. Even so, it was the CEO himself who denied this rumor and said that we will never see this type of front camera . You can also read: Lu Weibing denies the rumors, the new high-end Redmi will not come with a retractable camera . From XiaomiAdictos we think that the most likely is that the front design of the new high-end Redmi, which is also probably called Redmi X or Redmi Pro 2 , comes with a new front camera embedded in the screen . And, as you said before, Lu Weibing was the one who said a few days ago that we will not see a retractable camera in the Redmi range . 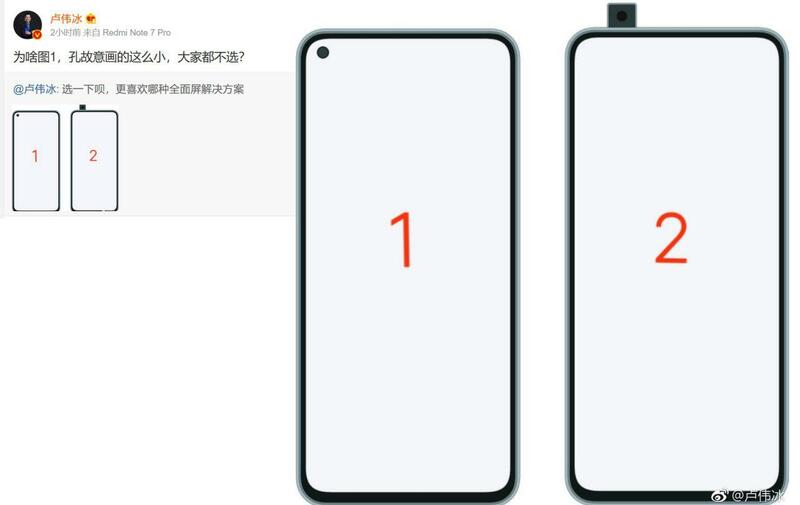 In addition, the date of this article, most of the fans of the brand that have commented on Weibo have chosen the first design, that is, the front camera integrated in the screen . And you, what design do you like the most?